I’ve been a really bad horse mom this past week. Whenever we get past a huge milestone that I’ve been working hard for (ie show) then I end up needing to pull back a bit. In this case, it’s not 100% my fault… Simon’s hives on his back were healing and his girth is rubbing him so I wanted that to heal while the new one is shipped from SmartPak… but really I’ve just been lazy. After spending a weekend with family and eating junk and drinking too much (can someone be hungover for more than one day? I mean really I know I don’t drink much but that was ridiculous), I woke up with an awful stomach ache on Sunday morning and texted my trainer that I wouldn’t be able to come to the lesson. Ended up sleeping late and felt better by late afternoon, so I cleaned the house some. Let me begin by giving you a disclaimer that I while I can take pictures of horses jumping over objects, I stink at interior design photography. With that said, I live in a tiny little house. But I don’t live alone, and I’m only marginally successful showing so therefore I sneak equestrian accents into my home in different places. In the guest bedroom, I did these paintings almost two years ago now. It’s a silhouette of a Boston Terrier, a Springer Spaniel, and then of the horse I had at the time – Teaspoon. I should update the horse silhouette to one of Simon and not a draft cross… but I’m lazy. Our one and only hallway is about 1/3rd covered in art and different ‘stuff’ right now. Most of these pieces are horse or dog related… whoops. I should probably put a wedding picture in there or something. My grandfather was an excellent carpenter and artist. When I was little he would cut horses out of the jigsaw for me, and one day I asked for a “real” horse (aka 3d and not 2d) and that began a several year adventure into wood carving. These are his equine creations. The Clydesdale is the one that got finished before he passed away, but the Lipizzaner is amazing even in its unfinished state. I keep these in my china hutch. Also in the china hutch are these plates made by my uncle for our wedding. There are 6, and each has a different asian inspired horse on them. They’re super cool, and I use them whenever we have a get together to put stuff out on because they’re so pretty. In the corner of my living room I made these cheap little shelves out of wooden file folders from Ikea. They house some trinkets special to us which include a Peter Stone model horse I had ordered to look like Elvis as well as one of Elvis’ old horse shoes. My bathroom is NCSU red, not orange like the picture shows. 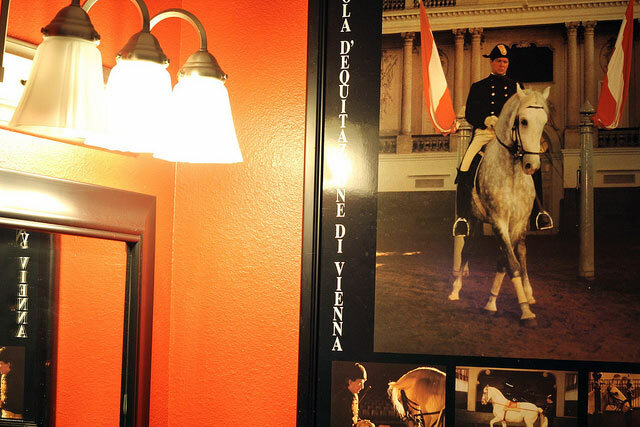 This poster I got from the Spanish Riding School in Vienna, Austria goes well with the red/black/white decor. The last and newest addition is what I did yesterday afternoon, aka stuff all my ribbons into these two glass vases. I left a few extras out for projects which I’ll have to show you soon… but I was pleased with preserving these while still being able to see them every day. The little wooden sign is one my grandfather made for my little wooden Breyer stable when I was a kid. 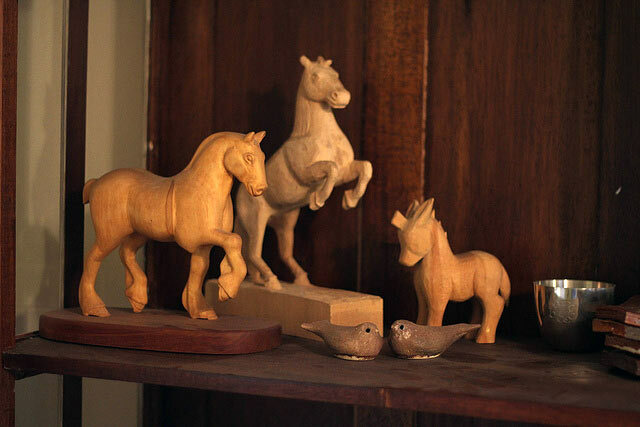 What kind of horsey stuff do you have out in your house? 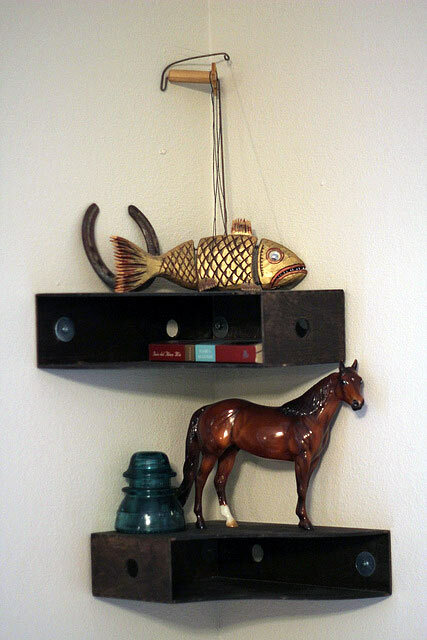 Oooh, you do a much better job of incorporating horses subtly into your decor than I do. I might have to steal your magazine holder/shelf idea. That’s cool! Ah the ikea folder shelves, saw something similar on Design*Sponge or Apartment Therapy. Oh wow. Very neat. My aunt gave me a horse sculpture made from leather that I have on a shelf, and I also have a gorgeous painting all in neutral colours of a galloping horse. Other than that, I don’t seem to have nearly enough equestrian decor! Almost all my horsey stuff is in the tackroom. I do have ONE print from a 1613 edition of de Pluvinel, the King of France’s riding master, hanging in the living room. That’s about it, lol! Early on Hubby said NO to my horsey stuff around the house. I get it. He did give me one room though so it’s covered with horse decor from floor to ceiling. Right now every square inch is plastered with more than 60 show ribbons (I know because I stopped counting at 40). It’s easy to get ribbons in dressage because our classes are usually tiny. I have been desperately looking for a way to use the ribbons besides hanging them on picture frames. 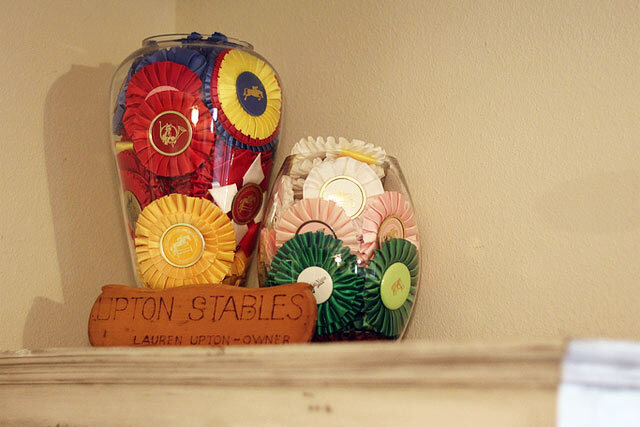 I have two glass vases in front of me right now that I am going to try and “stuff.” Please share other ways to repurpose horse show ribbons. I don’t want to get rid of them, but they are piling up dangerously! I’ve seen lots of cool ideas for recycling ribbons for sure. None of them are my original ideas, but that’d be a cool post! Wow those photos look like they were pulled from Vogue Living or something…. I love your decor. Totally don’t mind – it definitely wasn’t my idea at first and it’s a great way to store ribbons! Wow! 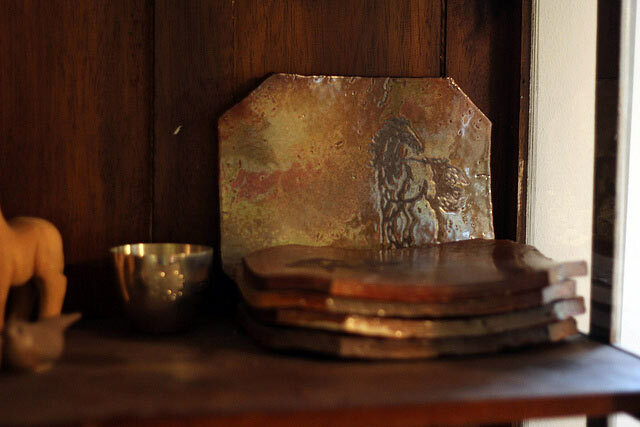 the wood carving collection from your grandfather is very special. And the plates from your uncle look amazing as well. Lots of great decorating ideas. I have some pretty fun horse things in my house but I can’t take any pics right now b/c all our stuff is still on a ship crossing the ocean. Maybe I’ll do that sometime, though. 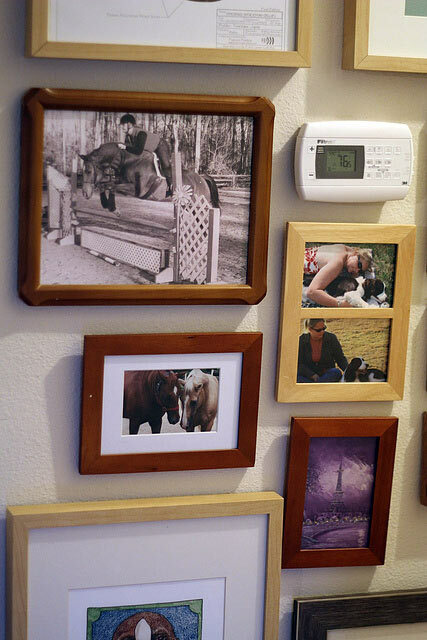 It’s fun to see how other people incorporate horses in their decorating. Loads of pictures of Houston. As well as a few of old horses. Otherwise I don’t think I have much horse related decor. Unless you count the saddle pads I hang all over the place to dry or the boots casually strewn about. Great décor!! That is so cool that you have such beautiful artistic pieces hand-made for you by your relatives. I think there’s at least one horse object in every one of the rooms in our house- including a saddle and some clean horse blankets in the dining room- eek! I’m no Martha Stewart I guess. The wood carvings and plates are beautiful! You have such a talented family! 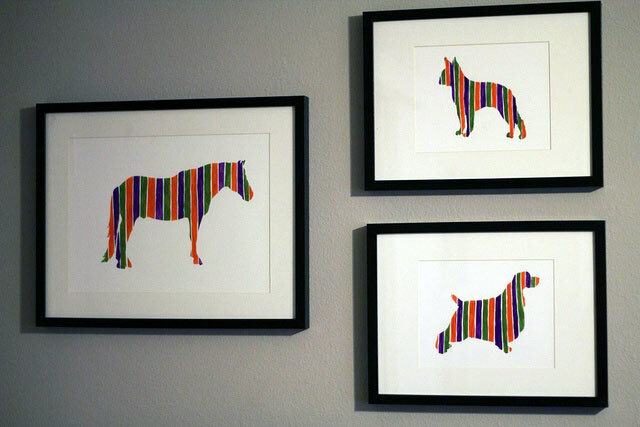 I also like the silhouettes of the animals – looks like something fun to try making! 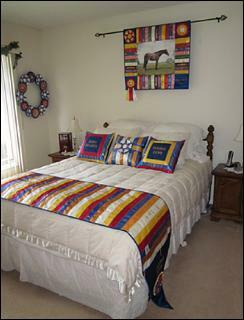 I was just thinking about doing a post on horsey decor, but haven’t got around to it yet. I have a few pieces stashed here and there in the house. I have a nice set of harness brass to hang up and some little bits and pieces. I have my first english saddle that my Dad bought me the year before he died that I’m planning to bring into the house one of these days. Just need the hubby to make me a nice wooden saddle stand. Do a post! Do a post! I love to see what other people do and hear more ideas. I think your horsey decor is great! Your grandfather’s carvings are amazing, if I had something like that I would keep them safe forever, too. Love your decor! The wooden horses made by your grandfather are my faves. Love the vase idea for the ribbons! loving your interior design skillz! lol no but really I am jealous. Very sophisticated and horse themed but not TOO much. love it! I need to know how you made those paintings. They are awesome! 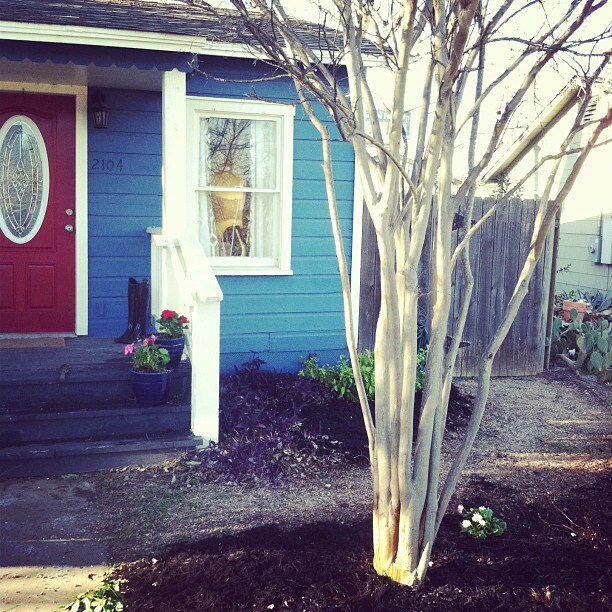 Such an artistic & creative family & gorgeous home! Hopefully when my place is finished I will have 1/3rd of your class 6 skill to “horsi’fy” my home!